Do you believe in the theory of re-incarnation? Do you think that a man dead one hundred years can come back to life and take up his place in the world where he left off? 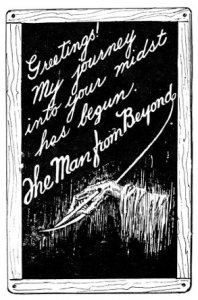 Houdini, in his initial photo-drama for his own company, “The Man From Beyond,” which begins a seven days’ engagement at the Leathbridge Theatre, commencing Monday, has treated this theory in a picturization that is most novel and unique. It is a master production in the fullest sense, with a story of heart interest, mystery and thrills. Houdini, in the title role, will be seen in a part unlike anything he has heretofore attempted. Aside from an unusual display of histronic talent, he indulges in a series of spectacular feats which outrival any of the mysteries for which he has been long famous. “The Man From Beyond” opens in the Arctic regions, and tells the story of a man brought back to life after being entombed for one hundred years in a mass of solid ice. How he again takes his place in the advanced state of civilization, meeting what he believes to be a reincarnation of his sweetheart of a century ago, his fight to bring back the love so long denied him, and culminating with his rescuing the girl after being whirled through the surging waters of Niagara rapids to the very brink of the falls itself, provide unusual entertainment.